It's once again time for a giveaway here at PhoneArena! And since our readers are super-cool people, you know that we're only giving away super-cool stuff. This time is no different! 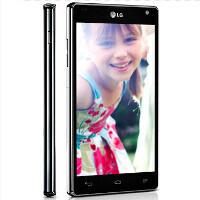 In partnership with AT&T, we're giving away a brand new LG Optimus G! Yes, that's the one with the ultra-fast Snapdragon S4 Pro chipset. The LG Optimus G is currently available for pre-order at AT&T, so everyone who isn't lucky enough to actually win this giveaway can easily pre-order one here! The handset costs $199.99 with a two-year contract, which is a pretty good value. If we have to give you our opinion about the Optimus G, we'd say that it's definitely one of the better high-end smartphones that we've seen this year. It has an attractive design, super-fast hardware and a well-optimized software experience. No wonder that we rated it 9/10 just a couple of weeks ago. If you want to know more about it, you can read our full review here, or simply watch our detailed video review here. In order to participate in the giveaway, please answer the question in the survey form found at the end of the post! We'll randomly pick and announce one lucky person next Monday (November 5), and contact them via the email address they used to register on PhoneArena. *Update 5 November* we have drawn the lucky winner - congratulations to mozes316! Thanks Phonearena for giving us the chane to win this! A filter for all the Android and Apple fanatics. Windows people haven't got to me yet. Is AT&T and Verizon coming to India? Anyone?? Please let them come for this very contest. Not that I have heard of it so far. Nope... don't think so. They can't afford doing business here as the competitions is tough already. It would be nice if they came...atleast it means expansion for them. But again, like you said competition is getting tough. AT&T, Tmobile and a few others make money selling certain technologies to Indian carriers. They can't directly use their technologies (hence can't offer more than what Vodafone already offers) here and have to play by TRAI rules and getting spectrum here would be a major headache. If you win this phone you should keep it and not get the Note II. This phone rocks. what makes this phone better than the Note II? OMG!!! I want this LG!!! I'm very excited for this LG Phones. Please pick me. Snapdragon S4 Pro Processor has an ultra high performance... I wish I could win the phone.. This phone is amazing. Phone Arena is amazing, too.